International and Bollywood actor Anupam Kher opened up saying that he was hurt by Pakistan's decision as to not hand him visa for his visit to Karachi for a literature festival. He recently said in a news conference, "I am not angry at anyone, I am hurt and saddened. I did not personally ask for a visa, the organisers of the Karachi Literature Festival did.” He also added saying, "For the last 15 days, all my visa documents are ready. The organiser of the Karachi lit fest said that (Pakistan) government officials told her ‘don’t invite Anupam Kher’. I don’t know why." Has my visa been denied because I speak about India's rich tradition of tolerance or I am a Kashmiri Pandit who may expose Pak terror nexus? According to sources, a Pakistani diplomat earlier said Kher had not submitted any visa application. It was in the month of May last year that the actor was first denied a visa to Pakistan. He was going to visit Lahore for an event hosted by an NGO but it was denied on security grounds. This time, he was invited as a guest for the three-day Karachi Literature Festival, which begins on Friday. Upset about his denial he said, "Has my visa been denied because I speak about India’s rich tradition of tolerance or I am a Kashmiri Pandit who may expose Pak terror nexus? Indian government welcomes Pakistan based writers, artists, actors etc. Pakistan government bans entry of Indian actors. Why fear a free dialogue." 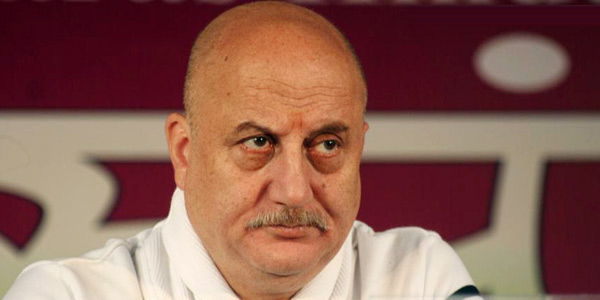 Finally Anupam says, "I feel bad for all those people who were looking forward to meet me in Pakistan and vice versa". Other Indian celebs who will be present at the literature festival are Laxmi Narayan Tripathi, Rahul Singh, Om Arora, Urvashi Butalia and Ashok Chopra.